JS: "This venue is smaller than Tokyo. I came here before, this place reminds me of the past...While I was at backstage earlier, I recalled being with a member in the past." JS: "I speak very good Japanese 5 years ago, now it's in a mess. Everyone can understand what I'm saying?" JS introducing My Night: "It’s a song in the whole album that’s the most soulful. Everyone should listen 'My Night' like as if you’re lost in a jungle and feeling unease...Recalling back the sufferings and plights you’ve once encountered." There's about 10 fan boys around fan's seat! A fan boy shouted: "Marry me, Junsu!!!" 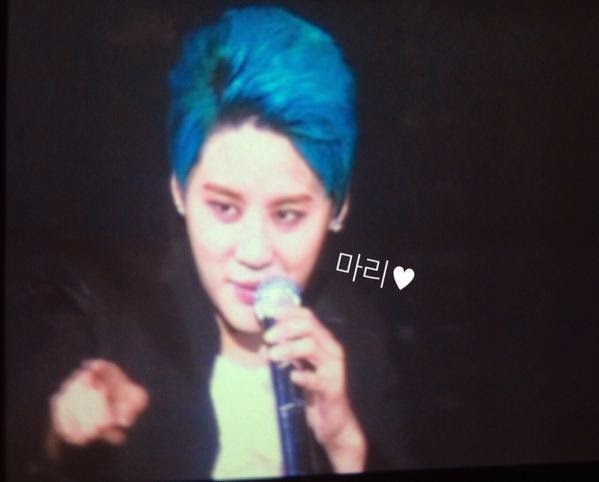 1st thing Junsu asked during Genie Time: "Is there anyone here for the 1st time, why you come?" That fan boy who gave Unagi Rice to JS came 2day again. JS pointed at him & shouted: “Nagoya! Unagi Rice! U’re here again! You came to Fukuoka right? Came right?” JS then pointed thumbs up to that fan boy! 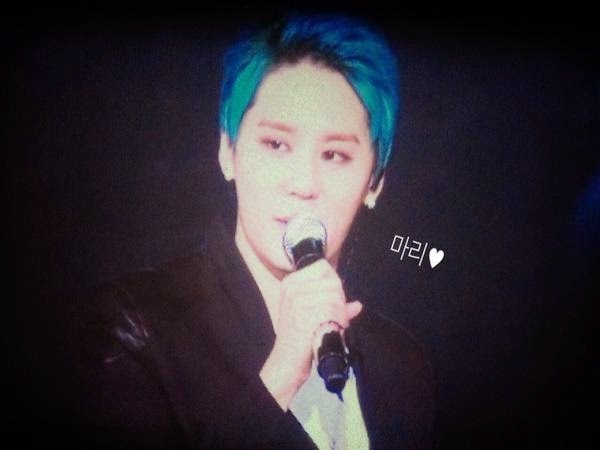 Genie Time 1: JS sings "I Am Music"
Genie Time 2: Fan request Junsu to imitate Yoochun! Genie Time 3: Junsu sings "Tonight"
JS: "I really like Nagoya! Because there’s Unagi Rice! Haven’t ate it yday, I have to eat it before I go back (Korea)! Anyone never ate Unagi Rice before? Why so?" Fans: “Because it’s from Tokyo!” JS: “I as a foreigner have eaten it before, why you guys never? Actually I ate Unagi Rice in Tokyo too, I envy you guys! You can eat Unagi Rice anytime!" JS says he loves Unagi Rice the most in this whole wide world! His most favourite food! JS: “News have already been released? I’ll be performing in 'Death Note' Musical as ‘L’ in June, all must come and watch yah!!" JS: "The song I sang just now is “Breathing in Love”, does everyone have a partner that can exchange “Breathing in Love”? 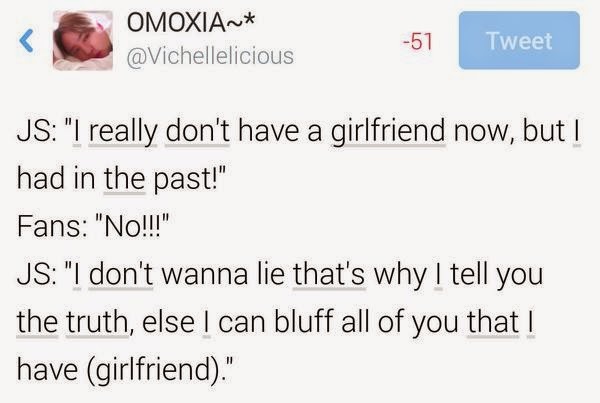 Do you have a boyfriend or husband? Fans: “No! !” JS: “Those who shouted no is the most suspicious!” Fan: “I broke off with my boyfriend!” JS replied excitedly: “Who? When? Is it because of me? But I’ve not done anything. You came to my concert after breaking off, don’t blame it on me! Everyone don’t allow me to marry..Only let me marry when I’m 77 years old, but by then I won’t be able to have kids..I still wanna see my baby! Wanna teach my baby to sing and perform in musicals!" JS: “JJ has already enlisted, the next is YC, and I’ll be the last one. You won’t be able to see us in 2-3 years...You will see the real us when we return. JYJ and myself will put in a lot of effort to achieve this." Junsu: Yes? 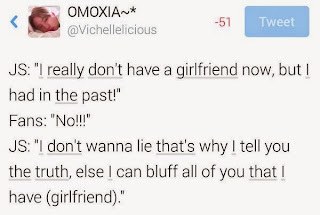 Girlfriend? I don't have one!!!! I'm really lonely these days...while everyone has a boyfriend!!! Junsu: Everyone wants to meet me? I really want to meet everyone in Nagoya also. It started in Osaka, Seoul, Sanghai...Shanghai? Thai, Tokyo, Fukuoka and today, in Nagoya! Finally, It's Nagoya. This is the last for this tour. Junsu: The day before is the last? Tomorrow is the last day. Today feels like the last day for me. I will work hard as much as that! 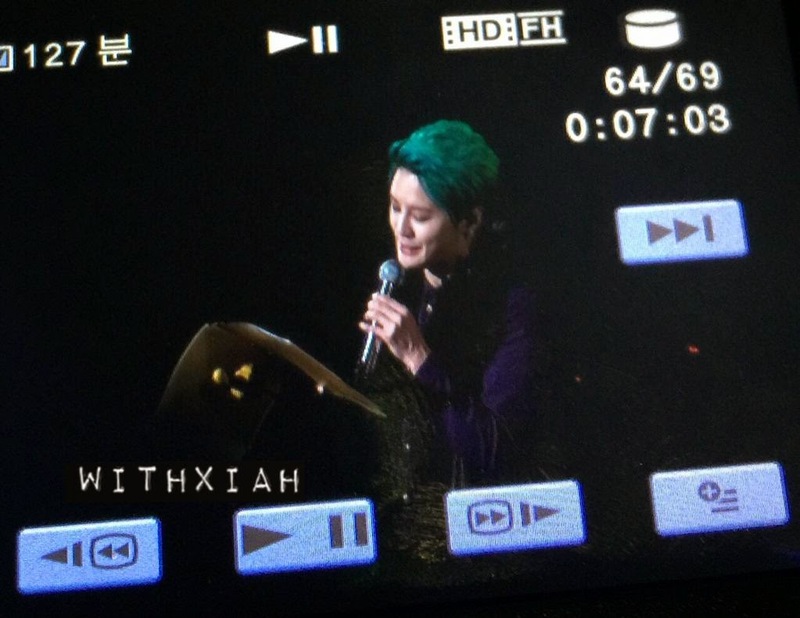 Junsu: Ah, it's the first in Gaishi Hall? It's been a long time? Junsu: Then, I will try to sing the new songs from the new album. Isn't it a little bit weird to say new songs from the new album? Junsu: I want it too but... (laughs) Please listen. X song. Junsu: I want to be a master in Japanese, but I can't be a master at all. I will work harder until the time I become a master! Junsu: Honestly, it's not that hot recently. I'm lonely these days so...everyone's not aware of it, but it's because I'm already 30 yrs old. Junsu: It's not hot but...everyone kept on say that it's not...don't you think it's too much? Junsu: Saying that I should just get married when I'm 77...while saying to me that I should stay alone..
Junsu: Everyone's boyfriends...or husbands...there's all of it? Right!!!!!!!!! Junsu: Because everyone is staying...My energy in this concert is as much as that. AH, but what am I always talking about this. Junsu: ...high school students, I will stop today. Ah, but I'm a healthy 30-year-old man...right? Junsu: Be sure to come someday when everyone is already an adult, okay? Clearly? Junsu: I'll show you brilliant clothes as well. Junsu: There are a lot of male (attendees) today? They suddenly appeared from the start earlier! Are you married? You're married, right!!! Junsu: Why did you come in the first place? Your mom? Your sister? Your aunt? Ah, you went because someone suggested it? Junsu: Ah. Nagoya!!! You're also here? You went to Fukuoka too? You went to all? Ah..Your mom is next to you? Junsu: Recently, more than the song or performance...uhmm...how should I say this. It will be that corner! I will still try do it (all)! 2nd) Junsu: Wow, this is an old song. This song...ah! You're my melody? Ah...in Japanese...how should I really say this...It was 7 yrs..
Junsu: Ah, everyone, this corner. ㅋㅋ Ah...uhmmm...what...I really don't know what will come out! A stressful corner. So, the last wish! Junsu: Something that is good~ this in Japanese? Yes? What song is good if I sing it in Japanese? My face is really red now! 4th) Junsu: Please dance~ Ah, but I don't have an idea if what is the dance that will come out? It's okay? (about the steps) Ready? Junsu: I'm really seeing a lot of male audience in this concert. (Male fans: Junsu!!!) Ah, doing it already? 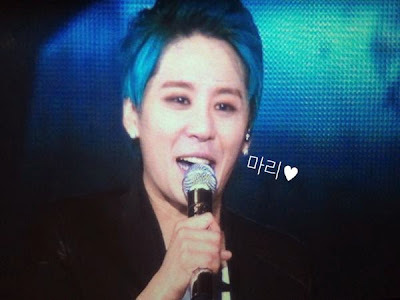 Junsu: I heard the voices of the male audience. Everyone! In unison! Do it? 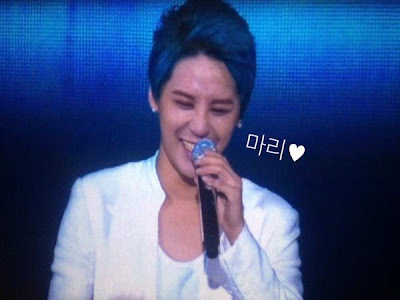 Junsu: Female audience, just 'Junsu' in low voice! At this rate, you can't do it? Male audience's voices, staaaart! Junsu: The 10s should try it, too? The 20-year-olds can't do it. Junsu: From those who are 19...Shall I hear the voices of just the babies now up to the 19-year-olds?